After an all-night meeting, the European Council finally arrived at a deal on migration on 29 June 2018. Here are the conclusions that were adopted. See also commentary/news stories from ECRE, The Economist, and Politico. Austria is assuming the Presidency of the Council of the European Union. 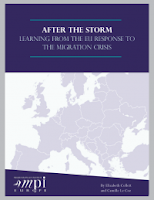 Here is a briefing on its priorities, with "migration and security" listed first. - EMN's 10-year anniversary report.